Today we will learn about electrochemical machining principle, working, equipment’s, application, advantages and disadvantages with its diagram. Electrochemical Machining is a non-traditional machining process in which metal removed by electrochemical dissolution. Now days this process widely used in many industries due to its advantageous operation. This process can take as inverse of electroplating process. Electrochemical machining works on the Faraday law of electrolysis which state that if two electrode are placed in a container which is filled with a conductive liquid or electrolyte and high ampere DC voltage applied across them, metal can be depleted form the anode (Positive terminal) and plated on the cathode (Negative terminal). This is the basic principle of electrochemical machining. In this machining process, tool is connected with the negative terminal of battery (work as cathode) and work-piece is connected with the positive terminal of battery (work as anode). They both are placed in a electrolyte solution with a small distance. When the DC current supplied to the electrode, metal removed from work-piece. This is basic fundamental of electrochemical machining. In electrochemical machining process, a high value of direct current around 40000A and low value of potential difference around 10-25V is desirable. The electrodes are place at a inter electro gap witch is desirable for machining. If the inter electro gap not too small witch can generate arc or not too high witch is not suitable for machining. It is about 1mm. This high values DC current is form by convert three phase AC current into DC current by using Silicon Controlled Rectifier. It consist piping system, storage tank, pump, control valve, pressure gauge, heating or cooling coil etc. 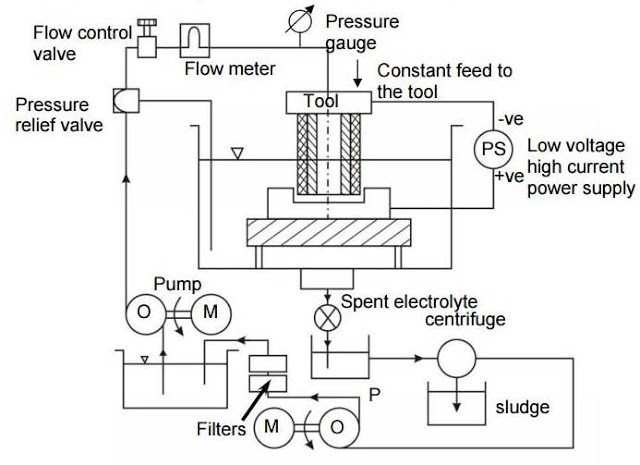 in the electrochemical process, the metal removed from work-piece form sludge which should be remove form electrolyte. This system control the flow and cleaning of electrolyte solution into the container. Piping system is made of SS steel, Glass fiber reinforced plastic, plastic lined MS or similar other anti-corrosive material. The tank capacity is about 500 gallon for per 10000A of current. Tool is made by an anti-corrosive material because it has to withstand in corrosive environment for long time. It should also have high thermal conductivity and easily machinable. The dimension accuracy and surface finish of work piece is directly depends on tool dimension. 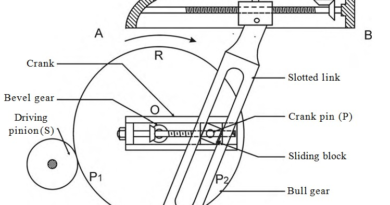 Those part of the tool, which is not required for machining, should be properly insulated because lack of insulation tends to unwanted machining which give dimensional inaccuracy. In this process, work piece should be well electric conductive. Only electric conductive material can be machined by this method. Work piece take as anode in this process. The work holding devices should have non-conductive property. Electrochemical machining works inverse as electroplating process. Metal is removed form anode into electrolyte and convert into slag form by reacting opposite ions available in electrolyte. This process works as follow. In ECM, the electrolyte is so chosen that there is no plating on tool and shape of tool remain unchanged. Generally NaCl into water takes as electrolyte. The tool is connected to negative terminal and work is connected to positive terminal. When the current passes through electrode, reaction occur at anode or workpiece and at the cathode or tool. To understand proper working let’s take an example or machining low carbon steel. Due to potential difference ionic dissociation take place in electrolyte. When the potential difference applied between the work piece and tool, positive ions move towards the tool and negative ions towards the work piece. Thus the hydrogen ion moves towards tool. As the hydrogen reaches to the tool, it takes some electron from it and converts into gas form. This gas goes into environment. When the hydrogen ions take electron from tool, it creates lack of electron in mixture. To compensate it, a ferrous ions created at the work piece (anode) which gives equal amount of electron in mixture. These Ferrous ions react with opposite chlorine ions or hydroxyl ions and get precipitate in form of sludge. This will give ferrous or iron into electrolyte and complete the machining process. This machining process gives higher surface finish because machining is done atom by atom. For better understanding watch following video. ECM is used to machining disk or turbine rotor blade. It can be used for slotting very thin walled collets. ECM can be used to generate internal profile of internal cam. Production of satellite rings and connecting rod, machining of gears and long profile etc. It can machine very complicated surface. A single tool can be used to machining large number of work-piece. Theoretically no tool wear occur. Machining of metal is independent on strength and hardness of tool. ECM gives very high surface finish. High initial cost of machine. Design and tooling system is complex. Fatigue property of machined surface may reduce. Nonconductive material cannot be machined. Blind hole cannot be machined form ECM. Space and floor area requirement is high compare to conventional machining. This is all about electrochemical machining principle, working, equipment’s, application, advantages and disadvantages. If you have any query regarding this article, ask by commenting. If you like this article, don’t forget to share it on your social networks. Thanks for reading it.